This month marks the third year of National Ladder Safety Month presented by the American Ladder Institute (ALI). This observance raises awareness about ladder safety to reduce ladder fall-related injuries and deaths. Each year more than 500,000 people are treated—and about 300 people die—from ladder-related injuries. In the United States alone, ladder injuries cost more than $24 billion in medical, work, legal, liability, and pain and suffering expenses. Falls from ladders continue to be a persistent problem for workers across many industries. For example, it was estimated that over 120 miners and 10,350 construction workers sustain a ladder fall-related injury on the job each year. Slipping at the ladder base is the leading cause of extension ladder falls, and improper ladder setup angle can impact ladder stability and contribute to falls. To help educate employers, safety and health professionals, and workers, NIOSH has developed resources to draw attention to work-related ladder falls. 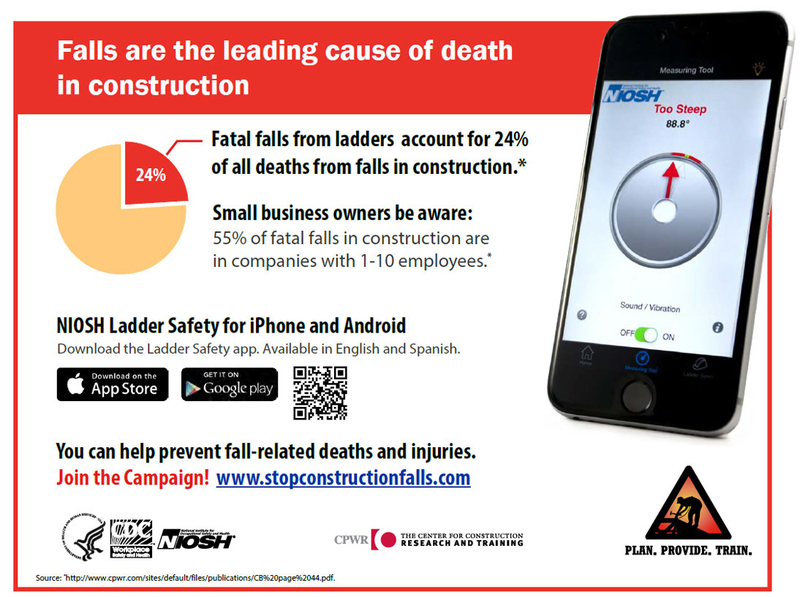 The free, award-winning NIOSH Ladder Safety app provides users with a host of tools to safely use extension and step ladders, from proper ladder selection to set up and use. The app has been downloaded more than 273,000 times. We also have a GIFCdc-image, or animated image, that demonstrates how the angle measuring tool works. Besides the ladder safety app, NIOSH has developed a number of infographics related to ladder use, including one that identifies six steps that miners can take to safely use a ladder. Another social media graphicCdc-image shows how ladders account for 24% of all deaths from falls in construction. A number of ladder-specific resourcesExternal are also available on the Stop Construction FallsExternal website, which was developed with OSHA, CPWR—The Center for Construction Research and Training, and other partners, to prevent all fall types that occur in the construction industry. In addition to these resources, NIOSH partnered with ALI and other groups to evaluate the effectiveness of two extension ladder positioning methods that use different body postures. Results showed that when setting up a ladder, users should hold the ladder rails at shoulder level, also known as the fireman’s body method, versus the standard method of holding a rung. The fireman’s body method is another way to more accurately set the ladder angle when users don’t have access to the NIOSH Ladder Safety app. The ANSI A14 standard committee adopted this ladder positioning method in the latest revision to the ladder safety standards. Extension and straight ladders sold after January 1, 2018, and following the new standard, will include new safety product labels with detailed graphics describing the correct body positioning method. I encourage you to use the many resources NIOSH has created to prevent worker ladder-related falls and share them with your colleagues as a way to mark this very important observance. Also, be sure to follow us on Facebook (NIOSH), Twitter (@NIOSH), and Instagram (@nioshusa) to learn more about our efforts to help keep those who use ladders for work safe on the job. NIOSH and partners will host a webinar on March 20th at 2:00 p.m. EST on the National Campaign to Prevent Falls in Construction and on preparing for the 2019 Safety Stand-Down. This hour-long webinar will bring together leaders from NIOSH, OSHA, and the Center for Construction Research and Training (CPWR) to showcase the past successes of the campaign and its major event, the National Safety Stand-Down, as well as to highlight plans for 2019. This year’s Stand-Down is scheduled for May 6–10. The webinar is free to attend. Register hereExternal. Beginning in April, NIOSH will offer a series of free, confidential health screenings to coal miners as part of the Coal Workers’ Health Surveillance Program. The screenings are intended for the early detection of coal workers’ pneumoconiosis, also known as black lung, a serious but preventable occupational lung disease in coal miners caused by breathing respirable coal mine dust. All coal miners—current, former, underground, surface, and those under contract—are welcome to join in. Screening locations, dates, and times will be posted on the program’s webpage, Facebook, Twitter, or call the toll free number (1-888-480-4042) for more information. NIOSH has revised the requirement for respirator labels for air-purifying and powered air-purifying respirator configurations. Beginning March 1, NIOSH no longer requires applicants to provide separate full filter and cartridge labels. NIOSH is not changing the requirements for the full respirator label or the abbreviated filter and cartridge labels. For more information, please see the notice on the NIOSH website. The NIOSH Mining Program recently released a preview version of EXAMiner software for Windows PCs that’s interactive and allows mineworkers to practice finding, assessing, and mitigating hazards virtually before watching for the real thing out in the field. Intended for both experienced and novice workers, the software offers more than 30 preloaded scenes from a surface stone mine, or mine safety trainers can upload their own panoramic images taken by smartphones or digital cameras in any mine to personalize training sessions. NIOSH recently published a study conducting a review of infectious disease investigations in workplaces across the United States to better understand the range of cases, the risk factors for workers, and the ways to prevent infectious disease transmission on the job. Learn more. LT Michael Shahan, PE, received awards for the U.S. Public Health Service CDC Engineer of the Year and the National Society of Professional Engineers’ (NSPE) CDC Federal Engineer of the Year at a ceremony in Washington, DC, on February 22. The NSPE Federal Engineer of the Year award honors engineers employed by a federal agency that employs at least 50 engineers worldwide. LT Shahan is an engineering officer in the NIOSH Mining Program. Photo right (L to R): Administrator of the EPA, Andrew Wheeler; U.S. Surgeon General, VADM Jerome M. Adams; LT Michael Shahan; and USPHS Chief Engineer, RADM Edward Dieser. The final National Occupational Research Agenda for Healthcare and Social Assistance is now available. It has 17 objectives that call for research on worker safety and patient safety; infection control; sharps safety; safe patient handling and preventing slips, trips and falls; and hazardous drugs and chemicals, among other topics. It also calls special attention to research needed around safety and health for workers in veterinary medicine/animal care, long-term care, home care, correctional care, childcare, and other social services. The Draft—National Occupational Research Agenda for Hearing Loss PreventionCdc-pdfExternal is available for public comment until April 8. The NORA Agriculture, Forestry, and Fishing (AgFF) Sector Council held a January meeting where Sector Council members shared recent success stories and ongoing projects that contribute to the goals in the AgFF Agenda. The Sector Council selected two priority areas for Council-led projects over the next 1–3 years: toxic stress and mental health, and safety and health of the aging AgFF workforce. This spring, the Council will focus on outlining the specific activities under these two projects and collecting and highlighting Council members’ activities towards the Agenda goals. If you would like to contribute to either of these Sector Council projects, contact the NORA Coordinator at NORACoordinator@cdc.gov. NIOSH is seeking partners to license a practical method that removes lead from contaminated skin. This NIOSH-developed method has been found to be highly effective in removing lead residues from skin. Many occupations can put workers at risk of lead exposure, including auto repairers, glass manufacturers, painters, plumbers, police officers, and others. Lead poisoning can lead to harmful effects on the body, and washing skin with soap and water is not enough to remove lead residue. To learn more about this opportunity to partner with NIOSH, please contact Kathleen Goedel at Kgoedel@cdc.gov or 513-533-8686. The Bureau of Labor Statistics’ Monthly Labor Review highlighted Collecting Union Status for the Census of Fatal Occupational Injuries: a Massachusetts Case StudyExternal as their featured story. The article describes the methods used as part of a special effort in Massachusetts to find what union information was available in administrative documents. Massachusetts found that union status could be determined for most cases using standard sources utilized by CFOI. The Massachusetts Department of Public Health is pleased to welcome Dr. Emily Sparer-Fine as the Director of the Occupational Health Surveillance Program. Dr. Sparer-Fine completed her doctoral work in environmental health at the Harvard T.H. Chan School of Public Health. Her research has focused on the intersection of physical, organizational, and social factors in the work environment, specifically among fire fighters, health care workers, and construction workers. The NIOSH-funded Centers for Agricultural Safety and Health (Ag Centers) are partnering with the American Farm Bureau Federation (AFBF) to promote Agricultural Safety Awareness Week, March 3-9. This event is part of the AFBF’s Agricultural Safety Awareness Program. During the week, a different safety focus will be highlighted: Monday, March 4 – Emergency Preparedness; Tuesday, March 5 – Livestock; Wednesday, March 6 – Heat Stress and Hydration; Thursday, March 7 – Roadway Safety; and Friday, March 8 – Hearing Safety. The theme of Agricultural Safety Awareness Week is “Safety: Know Your Limits.” For more information, visit the ASAP Facebook page. The Ag Centers’ YouTube channel also has new content and ideas about how to stay safe while working in agriculture, forestry, and fishing. Two NIOSH-funded Ag Centers are collaborating with the University of Minnesota Extension Office of Tourism to promote safety and health best practices to keep public visitors and workers safe while on farms. The 2019 Agritourism CampaignExternal kicked off February 25 and runs through April 5. The campaign aims to promote resources on safety and health related to agritourism operations. This initiative involves the NIOSH-funded National Children’s Center for Rural and Agricultural Health and SafetyExternal and Upper Midwest Agricultural Safety and Health CenterExternal. The International Journal of Environmental Research and Public HealthExternal, is planning a special edition of the journal on the occupational safety and health interventions needed to achieve decent work for all by 2030. For this special edition the journal is accepting manuscript submissionsExternal through January 31, 2020. The Connecticut Department of Public Health’s Occupational Health Program recently published The Opioid Crisis and Connecticut’s Workforce,Cdc-pdfExternal a white paper that challenges conventional models for addressing opioids in the workplace. The paper proposes a set of five key components that employers can incorporate into the workplace that recognize substance abuse as a chronic disease rather than a personal failing, incorporate the more current, evidence-based best practices of substance abuse treatment and recovery professionals, and identify the important role employers play as a partner in the treatment and recovery of workers and their families. A tree feller, working from a bucket truck as part of a small crew, died when he was struck by a large tree limb. The crew had been directed to take the tree down in small sections. After the supervisor left, the tree feller decided that the crew should try to bring the tree down in two large sections. Neither section fell in the direction intended; the second section fell uphill against the bucket truck, fatally crushing the tree feller. After finding that law enforcement officers experienced adverse health effects when responding to a scene where opioids and other illicit drugs were found, HHE Program investigators recommended the police department develop policies and procedures specific to opioids and other illicit drugs. Recommendations included continuing periodic training on how to prevent occupational exposure to illicit drugs. Read the HHE reportExternal to learn more. In March 1976, NIOSH released a bulletin alerting the occupational safety and health community of the potential hazards of workplace exposure to chloroform. At the time, NIOSH estimated that about 40,000 workers could be exposed to chloroform in many industries. More information is available: Current Intelligence Bulletin 9: Chloroform (DDM).